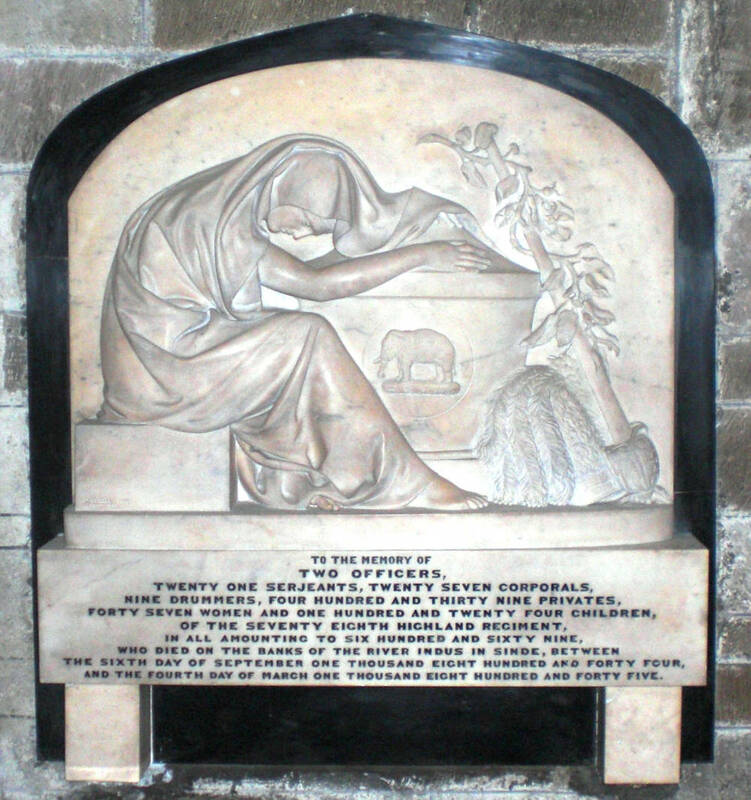 St Giles Cathedral, Edinburgh, contains a particularly poignant memorial to a Scottish regiment which suffered heavy loss of life in India. There is nothing particularly surprising about that; except all the losses, in this case, were from disease; an outbreak of cholera at Sukkur, some 230 miles up the Indus from Karachi in Sindh Province of modern-day Pakistan. The memorial in Edinburgh. Click on image to enlarge it. The Edinburgh Medical and Surgical Journal got closer to the truth. They attributed the deaths to remittent fever, bowel complaints, acute and chronic dysentery and diarrhoea. (p 17). In fact almost all the deaths were due to cholera, the causes of which were little understood at the time. It was not until The Broad Street cholera outbreak in the Soho district of London in 1854 (a mere 10 years too late for the 78th) that the physician John Snow produced his study and iconic map of the outbreak which conclusively linked the disease to contaminated water. And it was not until 1897 that Ronald Ross, a British army surgeon working in India proved that malaria is transmitted by mosquitoes. Until then the idea that disease was spread by a miasma of bad vapours (or “mal aria”) held sway. Not surprisingly the casualties to the 78th were on a scale which caused serious discontent. The suggestion that the problem had been exacerbated by excessive drinking and intemperance led the 78th to accuse General Napier of having obliged the regiment to march to Sukkur too late in the year, at the start of the hot season. The regiment commissioned one of the most eminent sculptors in Scotland. John Steell (later Sir John) was sculptor to Queen Victoria and had already fulfilled a number of high profile commissions including statues of Sir Walter Scott and Queen Victoria and two busts of the Duke of Wellington. The 78th memorial took him into a different genre and one which he would repeat with comparable success for the 93rd Highlanders memorial in Glasgow Cathedral for their losses in the Crimean War. Allen’s Indian Mail and Register of Intelligence London Saturday January 4th 1845. Asiatic Journal and Monthly Miscellany November 1844 to April 1845 Vol 4 Third Series, published London William H Allen 1845. .
Ewart, General Sir John. History of the ...Highland Regiments. London, William Mackenzie, Undated. Keogh, Captain. Journal of Captain Keogh late 78th Regiment. Unpublished but quoted in Ewart above. Napier, Sir William. The History of General Sir Charles Napier’s Administration of Scinde. London: Chapman and Hall, 1851. Ross, Sir Ronald. The prevention of malaria. London. Dutton, 1910. Snow, John. On the mode of communication of cholera. London; Wilson and Ogilvy, 1849. The Edinburgh Medical and Surgical Journal. Volume 76. 1st July 1851 published by Adam and Charles Black, Edinburgh 1851.